I’m into heightened experiences. Often going to great lengths to get the most out of my book selections. 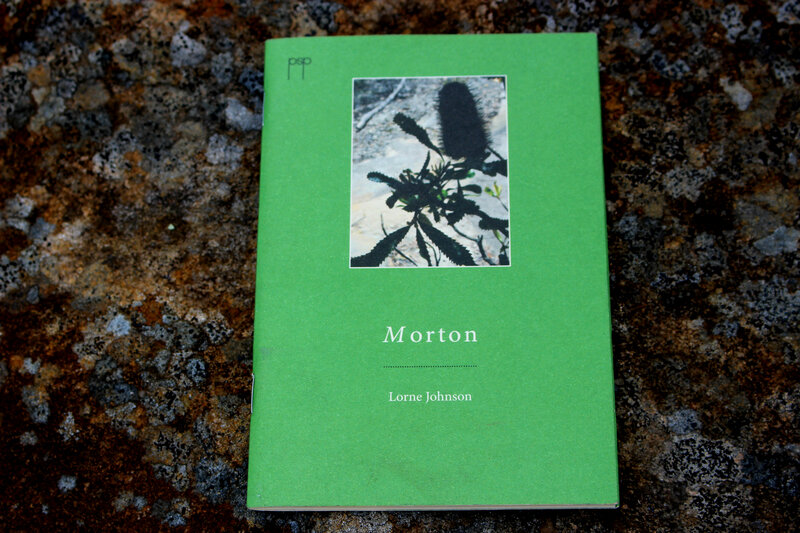 Thrills like reading Sautet in a coffee shop in Paris, Bourdain in Vietnam to simply sitting on a tree stump in the wondrous Southern Highlands of NSW reading Lorne Johnson’s poetry chapbook Morton in Morton National Park. A bridge too far perhaps? Never! Gunnin’ down Sheepwash Road, one is taken aback by the scenery, especially wondrous for us stuck in the city. The Bowral-set in their vintage boy racers hold up traffic with time travelers. Stories of old timers that come to light later like Sassafras 1903 & A Gold Miner At Yalwal, 1933. The history of the place is a great study of internal explorers and identities of colonial NSW, the dispossession of traditional country of the Yuin People with many significent sites of Aboriginal mythology and culture. No stranger to the area, older generations of my family where evacuated to Exeter during the war. It’s a small town in the Wingecarribee Shire close to Morton. Loads of stories of the bush and encounters with its wildlife relayed to me by my mother. This is what may have triggered my curiosity. On Saturday, I was the first to arrive. Good idea to start early. Nature is on the move as the day warms up and the walking tracks get busy on the weekends especially at my entry point of Fitzroy Falls. The area Morton covers is huge. It contains 200,000 hectares of unique species of flora and fauna found in the area. It is a birders paradise. It took a while for the buzz from these city ears to open to the quiet. You stand and wait to hear where the whistles land, look up and scan the trees for birds you’ve never seen. There are trees for special diets, fussy rare birds. As one walks, the occasional look down is welcomed, for unsuspecting lizards sunning on the edges of the tracks are often too blissed to notice walking boots. Twisted branches are used to dart from. Morton is a tangled mess and aftermath of storms and fire. Branches weighed heavy with wind splinter, wildflowers, insects and human interference. I can see exactly where the poems come from. Lorne’s poetry is another way to discover Morton and its guide to secret destinations and his love of birds. I know I will find Honeyeaters, Satin Bowerbird’s that are partial to ‘Smurfs‘ and ‘Ansell wrappers’ to swoon the hearts of potential mates. His anthropomorphic and humourous scenarios say a lot about himself, ‘sipping grog from a gumnut’ and ‘diggin’ Miles‘. Musical tastes beat fresh in a few stanzas, meeting his reflection in anothers nest. Superb Lyrebirds actions hints at a city boy’s eyes. Macleay’s Swallowtails and the unknowing help of a common wombat during one of the areas fires, just a few of the beautiful observations you’ll discover. Inside Morton, one is secluded in nature but surrounded by bustling country towns, some with dubious environmental agendas. Coal mines, polluting factories and hunters. A Reaction to a 2012 Hunting Proposal poem is met with a level head, reading the personality of culprits and possible problems that may occur. If this poem was read out at the council meeting, the NO’s would be unanimous. You won’t be bored with Yet Another Poem Featuring Gum Trees, Lorne knows these guys inside and out, he has such a beautiful take on things. He has a very colloquial heart, written in a different language but that’s because no where in the world, other than here, would you encounter a Dusky Antechinus or a Greater Glider, in places like Billy Bulloos Canyon or Dungeon Creek. You have to know what a wobbegong is to understand all the treasures here. I especially have never heard a Swamp Wallaby described more perfect. Lorne’s poetry is a medicine, a timeless message to explore and find yourself in the beauty of the bush. My close encounter with these poems, honeyeaters, parrots, wildflowers, waterfalls and a fork in the trail certainly enriched my weekend.